The Vision X20 elliptical offers three different consoles so that you can buy just the right trainer you want without having to spend extra on frills you won’t need or use. 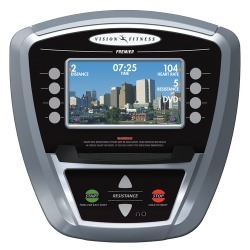 The trainer has three console choices: the Basic LCD console with 7 programs and readouts for time, distance, RPMs, resistance level, heart rate, calories, and watts;, the blue backlit Deluxe console with 8 programs, a scrolling message bar, and both telemetric and contact heart rate monitoring; and the full color Premium console with up to 22 programs, USB port, DVD compatible A/V ports, and more. UPDATE: The X20 is no longer available, replaced by the all new and improved X40 model. Check them out on sale here. 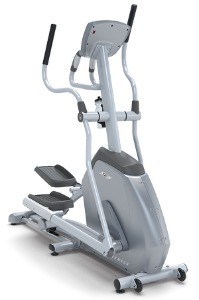 The Vision X20 elliptical has a nice warranty (3 years parts, 1-year labor) and a 300-lb user weight capacity. It has a multi-ribbed Poly-V belt drive train with an ECB Motor-operated Permanent Magnet and a weighted flywheel for smooth and quiet operation with a flatter ellipse pattern for a comfortable ride. Other features include stationary handlebars with contact heart rate sensors, moving handlebars for an upper body workout, Quick Start buttons, narrow pedal spacing, a 20" stride length, and a solid 188-lb frame. The Simple console has a basic LCD screen, 7 programs, 16 levels of resistance, and contact heart rate monitoring. The Deluxe console has a blue backlit LCD screen, 8 programs including the Octane SPRINT 8® feature, 20 levels of resistance, and wireless & contact HR monitoring. The Premier Console has a full color LCD screen with 4 background scenes and a slideshow for 10 personal photos, 22 programs including SPRINT 8®, wireless & contact HR monitoring, a USB port, and A/V ports compatible for an iPod and a DVD device. The Vision X20 is priced at $999 (Basic Console), $1,299 (Deluxe), and $1,499 (Premium). The basic trainer rates well in reviews for quality, quiet operation, ergonomics, and programming. If all you want is a good elliptical workout without the frills, the Simple console is the best option. If you want a hands-free telemetric heart rate sensor, the $1,299 is still a good buy. If you are going to spend $1,499 on the Premium console X20, then you should carefully compare its specs to other models at that price point. You will likely find better deals going with a different model. But for $999, the basic Vision X20 elliptical is a good choice.